As we get closer and closer to May, universities all across the country will be seeing thousands of students graduate and move on to their next stage in life. For many of them, that includes finding not only a job, but also a place to live. 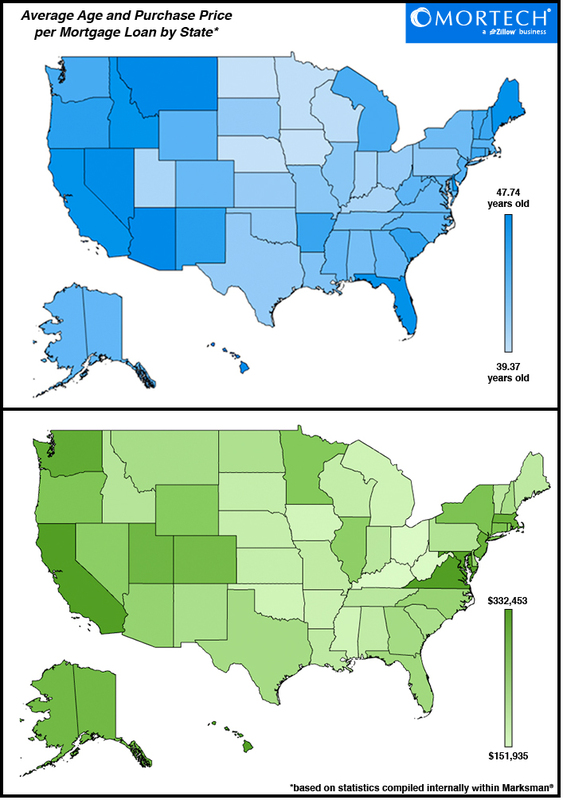 So we thought it would be interesting to pull some data compiled internally within Marksman to see which states have the lowest average age per mortgage loan, and then compare that with the average purchase price per mortgage loan. Interestingly, despite most college graduates being in their early to late twenties, the lowest average age was about 39 years old. This isn’t too surprising, considering most college students typically rent for the first few years after they’ve graduated. However, looking at the map noting average age state by state, the Midwest holds most of the states with the lowest average age, which correlates almost directly to the map of average purchase prices, in which the Midwest holds a majority of states with the lowest purchase price averages as well. The west coast is on the high end of both age and purchase prices, yet Florida, having one of the highest age averages in the country, actually sits in the middle of the average purchase prices per mortgage loan. Finally, on the east coast, the results are mixed, with most states falling to the medium to high range of age averages, despite relatively medium to low purchase prices. No matter what age your customers are, you need to make sure you’re pushing out the most accurate rates available. Find out today how Marksman can provide you with accurate, real-time rates instantly.